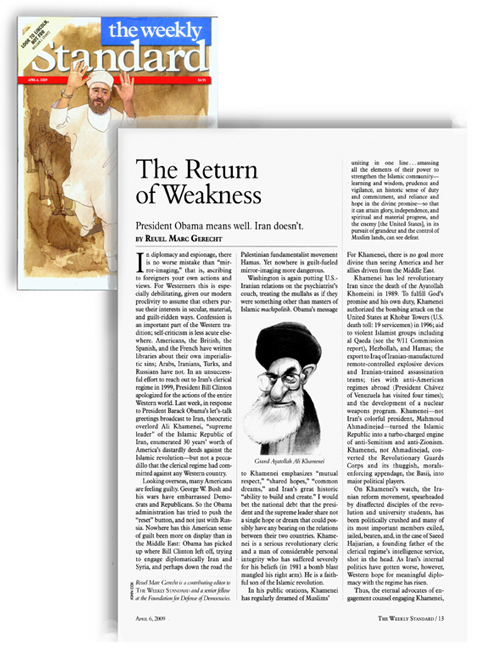 Philip Chalk (design director) at The Weekly Standard used my caricature of Ayatollah Khamenei in this week's issue (page 13). THAT'S GREAT, John, did he give you credit? It was a good article and an important analysis, John, thanks. I wouldn't have seen it had you not made this post. But Barack is so articulate... he speaks so well... the foreigners love him... & he obviously has so much more grace than every president who has preceded him. Take, for example, his brilliant gift to the Queen (a pimped-out Ipod loaded with "The Best of BHO"). What the press didn't report is that the Queen took it in stride & treated the gesture with the respect it deserved. ...a kitchen clock on a gold chain, a viking helmet, & a grill made with select jewels from the royal collection. Congratulations. I love it that you are getting more exposure. Congratulations, John. I love it that you are getting more exposure. Congratulations, John. I love it that you keep getting more exposure. This page contains a single entry from the blog posted on April 3, 2009 2:31 PM. The next post in this blog is SOUTHERNESS.